Quill Lettering Brushes Grey series 2000 by the Scharff Brush is an excellent overall lettering brush. The Quill Lettering Brushes Grey series 2000 is normally used for medium to small lettering. It can also be used as a fill-in brush and an outliner for large letters. The long hair length allows the brush to carry a lot of paint. These are Sign Making Lettering quills, made from the finest Grey Talahutky Squirrel hair. 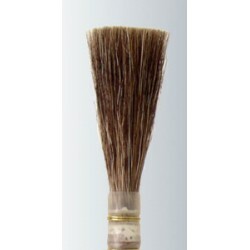 This brush excellent with softer hair, works great on glass, aluminum any smooth surface. Equally as important as the grey as an essential brush for the sign painter. Quill Lettering Brushes Grey series 2000 for hand lettering that are made from grey squirrel hair is much softer than hand lettering quills made from grey squirrel hair. These sign painter brushes come with varnished wood handles. Quill Lettering Brushes Grey series 2000 is handmade in France by highly skilled brush makers. This lettering quill is an essential tool in every sign painter's kit. The Quill Lettering Brushes Grey series 2000 quill is best suited for smooth or medium surfaces such as glass or automotive surfaces and plywood or banners. Grey Quills are slightly stiffer with more snap back in place action when stroking round letters than the grey quills, it's a personal choice. It has a round ferrule and the hair comes in graduated lengths. Quill Lettering Brushes Grey series 2000 Available in 0, 1, 2, 3, 4, 5, 6, 7, 8, 9, 10, 12, 14, 16, 18, and 20. Individual brushes listed BELOW! Grey-Line Brush Series-2000 Size 1 Scharff Brush Series 2000 - Size 1 Grey Liner Quills Made with the finest Grey Talahoutky Squirrel ..
Grey-Line Series-2000 Size 0 Scharff Brush Series 2000 - Size 0 Grey Liner Quills Made with the finest Grey Talahoutky Squirrel ..